this was one of the best tours we have taken...… thanks so much for a wonderful day. By all means , take the opportunity to lunch with the locals. "Tony" was fabulous. I am giving Tony T a five-star rating for his gracious mannerisms and his ability to share Saigon with us for a short time instead of the usual 7 hours. 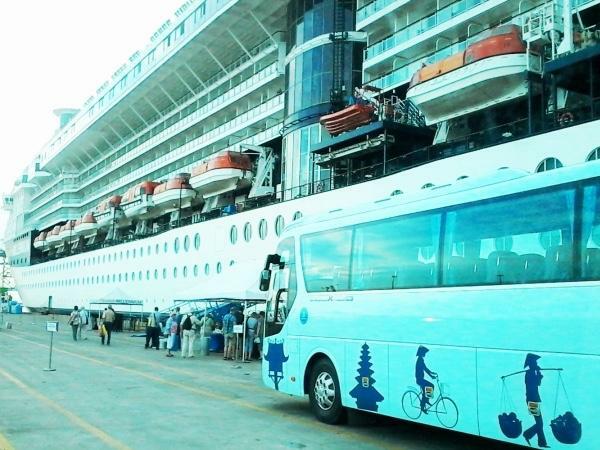 The port is far from Saigon but this tour was made possible depending on one's needs. We were a group of seniors and adults so the tour went at a slower pace though it was manageable. Most of the highlights were shown to us while we walk and others stayed in the bus. Nothing missed, enjoyed all and shopping as well. TOUR GUIDE RESPONSE: I am so lucky to have your group for this city tour from cruise port. And I am very happy to see you like the tour very much. All your group members were so nice and kind. Wish to welcome you and your groups again with long time or more days! Best wishes to all. Tony from Vietnam. Tony was an incredible guide! He is very knowledgeable and anxious to share with his clients. Tony's English is very good and he loves to talk and learn new English words and phrases to his vocabulary. He is very accommodating and flexible insetting the itinerary for the day. I would recommend him to anyone wanting to tour with the best guide we've found in our 3 weeks in Vietnam!! Tony was prompt and the ship pick up perfect. Tony and his driver took excellent care of us as we are now seniors and not as stable as we were. The insights into life in Vietnam were first class and the actual tour perfect for our needs. I would highly recommend Tony. TOUR GUIDE RESPONSE: To welcome two of you as the FIRST TOUR of the local New Year is my big lucky thing to me. Sure, after the tour, I got many new more information from you. Thank you very much! I am so happy to see you enjoyed the tour and lunch. P/S: A special thanks to your private comment. :) Best wishes! Tony from Vietnam. Exactly on time. Very safe driver. English good. Great wi-fi. Gave a good History lesson. Would recommend highly. Tony was a wonderful guide. It's a long day but doing both tours together. But Tony's knowledge and wit made the day extra special. The visit to the art factory and pagoda was a special bonus which we weren't expecting. I would definitely recommend Tony as a guide. Tony was a great guide and put together a very nice tour Mekong Delta/Ben Tre tour. He was professional, friendly, fluent in English and the actual tour and day matched the advance description that he provided very well. His transportation van was clean and comfortable and his driver was also very good and safe. Tony is a very informative and interesting guide. We enjoyed his insights about local traditions and perceptions. The car was very clean and we had a separate driver for added efficiency. I would not hesitate to use this guide again. Excellent tour guide, generous and lots of local knowledge. Accommodating and Fun. Tony's tour was absolutely amazing and exceeded my expectations 10 fold! He is extremely knowledgeable and is very familiar with the facilities. Everyone knows him and because of that, we bypass all lines and get special access. Highly recommend! Tony was very accommodating and knowledgeable. In addition, the lunch spot was great! Tony is an excellent tour guide!! Tony T. was the most enthusiastic guide we have ever hired. You could actually see how much he loves his job and is thrilled to show, as he would say, "My City". Tony T. took us to the Cu Chi tunnels and was very informative. After spending time at the Cu Chi Tunnels, Tony T. took us back to Ho Chi Minh City and give us a tour of the City. We would highly recommend hiring Tony T. to those wanting to see The City. Tony was a blast! Full of great information, funny and engaging. His English is MUCH better than he promotes. Tony is your choice in Saigon! Tony gave us a fabulous tour of Saigon, explaining the history of Vietnam and the progress and challenges faced by the Vietnamese people over the past 50 years. He was friendly and accommodated our request for chases to our itinerary. I highly recommend Tony as a guide for a one visiting Saigon. Tony is very knowledgeable, and just plain fun to be around. It's hard to find someone who is both! We thoroughly enjoyed our day with Tony, and learned so much about the language, the history, the economics - you name it, Tony knew it. The kids (13 and 11) also enjoyed Tony's approachable demeanor and interesting facts and stories. And (drumroll please) he found my husband fresh durian! No one else on our trip could find it since apparently it's not the right season, but Tony did! We would give Tony 6 stars if we could, as he exceeded our expectations! He was informative, gracious and accommodating. He was flexible and provided additional options to the tours that he sensed would be of interest to us. Although we had been in Saigon 9 years ago, he showed us the progress and development of the current Saigon. He was one of the BEST and we wouldn't hesitate to recommend him. Tony was a great tour guide with so much knowledge on the history and cultural beliefs of the people in Ho Chi Min city. We felt very safe with him and he made our day special. He was very flexible with what we wanted to see and the few changes we made to our itinerary. Tony was exceptionally accommodating and went out of his way to make sure everything was absolutely perfect. He is very knowledgeable across the board, and made great suggestions to enhance to our already extensive itinerary. He is a real local, and his passion for the region comes through all the time. Great days! Tony gave us a fantastic tour of the Mekong Delta. He was extremely responsive, reliable, and engaged. Our tour went off without a hitch. We got to see everything he promised, and more. Thank you Tony! Tony did an excellent job providing a varied and insightful day in Saigon. The included lunch was most enjoyable as was our afternoon coffee. Tony is intelligent, kind and warm. After spending the day with him we really felt a connection with him and his country. Over the years we have never been disappointed by Tours by Locals, but Tony may be the best guide we have had the pleasure to work with! We recommend him without reservation. We enjoyed our tour and found Tony to be informative and chatty. We took our 4 teenage children who especially enjoyed the visit to the coconut factory. During the visit to the farm we enjoyed the fresh fruit and the opportunity to make fresh sugar cane juice. There was also some local entertainment but unfortunately as it was in Vietnamese it was a bit lost on us. Overall and long but enjoyable day. Extensive knowledge on the history of Vietnam, and very exceptional itinerary which includes boat rides, candy factory and fruit picking. Tony was an excellent guide with good local knowledge and very helpful and friendly. Instead of travelling to Saigon/Ho Chi Minh City on our cruise ship excursion, we chose to skip the streets clogged with motorcycles and set off for the Mekong delta. Picked up at the port, we road 2.5 hrs to the delta for a delightful day learning about life in the delta, travelling on motorized and paddled boats, seeing a private folkloric show, picking and tasting tropical fruits at the orchard of the guide's uncle. Gourmet lunch-vegetarian specially for us! Tony is such a very informative and entertaining tour guide totally no dull moment! From the time we boarded our very own personal private car we felt like a VIP as he definitely takes good care of us and made us try majority of the local delicacies and street foods made by local housewives. I fell in love with the country so much and having Tony by our side was incredible. We weren't very familiar will all their customs and Tony was there to let us experience how it's like living in Vietnam. TOUR GUIDE RESPONSE: Yeah! We've got the great time in a long day trip together. Will miss two of you so much because of some special things...!!! Best Wishes! Tony T.
Tony was great, really interesting and had really good historic knowledge. Very easy to deal with and was great for pushing the start back after we had flown in late the night before. Would use him again when we return to explore more. We had a fantastic tour by with Tony in the Mekong Delta. Everything worked well despite having to have some flexibility due to the weather. He took us to some great family run enterprises where we got to see the rice paper making etc. All the food we had was great in particular both of the lunches. The tour was just for two of us so we felt well looked after and not herded around. The wet market is a must. Definitely recommend doing this tour especially if you need to maximize your time. Tony is very accommodating to his customers' needs. He guided a group of us (23) for two days in Saigon. Every one in the group was most complimentary of Tony's knowledge and pleasant disposition. I recommend him highly. We just spent one of the greatest days of our lives thanks to our guide Tony, who took us for an action-packed one-day tour of the Mekong Delta, or as Tony calls it, "my hometown." Certainly, having someone with local knowledge is a big advantage. But Tony's warmth, humor, preparation and attention to detail made our day even more enjoyable. We did so much in a single day! Tony is a gracious, kind, considerate and genuinely funny person. Being able to spend time with him was a privilege and a joy. Our guide took us to many memorable locations. He was very knowledgeable, enthusiastic and experienced. He shared his home town with us. Tony took us on tour of the Cuchi tunnels. What an AMAZING day! 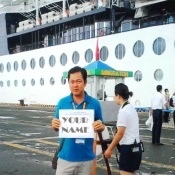 He was waiting & met us right as we exited the ship (their company is allowed inside the cruise port & some aren't). VERY EASY! It does take a while to drive to the city from this port but worth the trip. Tony had a driver (very nice van BTW!) & was able to share things on the drive. So informative. Loved all the stops and info. He spoke great English. Shared family history, knew shortest lines, food stops, + our wants. HIGHLY recommend TONY! Tony gave us an excellent two days of tours! He is knowledgeable about the area, traditions and attractions. The van and driver were also very good. We toured the Cu Chi tunnels, toured the Palace and saw so much more! I definitely recommend Tony. Tony was great at showing me around Ho Chi Minh on a last minute reservation. I wish there had been more walking around and less riding in the car, but he did a great job with an 8 hr layover. I would recommend using him. Tony was informed, interesting and very knowledgeable about Vietnamese history and culture. His tour was superb and included a "local lunch" which was the tastiest food we have enjoyed in Vietnam. The organisation including the driver and the routes chosen was also superb. I would highly recommend Tony. We had a very enjoyable stay and visit to Vietnam. A honest en most charming guide. Very well informed and flexible. We enjoyed the day very much and will remember it for long. We also want to mention that ToursByLocals is a good organisation and we will surely work with you again on our next trip. Tony always showed concern about our interests and never rushed us through any of the sites. He showed us absolutely everything that we could have wanted and we spent the entire day and way into the evening with him. He provided great transportation and made sure we tasted local foods for dinner. We would recommend him highly to anyone. Tony was great, we still have a hard time understanding how he covered so much ground in one day. His pace and use of our van was just right. We highly recommend him of any one that wants to see the sights and sounds of the city in a day. We started around noon when our ship docked and didn't get back until after 10pm and never felt rushed. The car and driver were great as well. great tour guide, very friendly, punctual, insightful, and was able to show what's important and key to see all in a day. provided a very unique experience with the bike rides, something that entrenched you into the culture that was very memorable, way better than any typical 'tourist' type of tour and more local feeling. TOUR GUIDE RESPONSE: Dear Mr Andres! Thank so much for your kind comment! I am so happy to see your feedback and will try more and more to give the better and better service to the customers in the future. Best Wishes! Tony T.
TOUR GUIDE RESPONSE: Dear Mr and Mrs Tomasz Breitkopf, I'd like to say THANK YOU SO MUCH for choosing me as the local tour guide and I am so happy to see your good feedback as well. A Very Nice Day to You! Tony T.
Great tour and great food during the tour. The Mekong delta is a very interesting place. Tony wanted to show us the area where he was born. Unfortunately the weather was not cooperating so that we had to stay with the more traditional tour. But that was still very good. Being able to set your own pace and not have to wait for the loading/unloading tour bus of the cruise line's shore excursion, makes a private tour worthwhile. And a friendly and knowledgeable guide as Tony makes it unforgettable. Tony was a super guide! We have limited time for our shore excursion and he helped us to use it in the best way. Trip to Mekong Delta is really amazing! I highly recommend it. The place where we had lunch is such a nice restaurant and the food was delicious!! Tony is a very nice guy, who explained us about his culture and traditions, and definitely made we really enjoy our visit in Vietnam. Tony was very cheerful and pleasant. His driver and Tony were professional. The driver drove safely and helped us get in and out of his van. Tony gave us a tour that we wanted. We visited several sites that were not visited by many tourist. He recommended 3 shopping places that were great and met our interests. Tony was informative and increased our knowledge of his country. Tony and his driver were excellent. Tony is a very good guide, unassuming and casually approachable to our sincere liking. We enjoyed his r edition of the recent history of Vietnam and Ho Chi Minh City. He also shared with us local cuisine and attractions. We particularly like his humour. This was fantastic. Tony was an excellent guide giving us a great insight into the history and current culture of Vietnam and the region. We loved his conversation and would love to have him show us through the rest of Vietnam. He paced the trip according to our needs and we really felt it was tailored to our interests. The food was delicious. Plenty of bottled water was provided. Tony was punctual and the vehicle was immaculate. I cannot recommend him highly enough. Book him now! Tha excursión was very good and the tour guide excellent. The only problem was that he did not check the port we docked in and was waiting for us in another port at 70 miles distance. We called him and we met downtown 2 hours later. Everything worked out fine after that. He tried to make up for the mistake and he really did his best effort. Great Tony!!!! TOUR GUIDE RESPONSE: Dear Ms. Ana Quinonez, I am so happy to hear from you. I'd like to send A SPECIAL THANK to you and your group because of your kindly understanding. It's so nice to be the local guide of your group in Vietnam. P/s: Hope to recieve your group again when coming back Vietnam in the future. I'll try more and more in every service. Tony T.
Tony and his driver were prompt and he was clear on where to met him. Tony's agenda for the tour was very informative and interesting. The driving in Viet Nam can be scary but we never felt in danger. Tony's has personal insight to the Mekong Delta and can speak about personal experiences. We stopped at local stands to see and experience local flavor and see how people live. Tony's English were very good and we had no difficulties understanding his detailed explanations. TOUR GUIDE RESPONSE: Dear Mrs. Stacy and Rosan, Thank so much for your kind comment! I am so happy to see your feedback and will try more and more to give the better and better service to the customers in the future. Best Wishes! Tony T.
Excellent tour guide. Good english and really enjoyed our time with him. Great day. TOUR GUIDE RESPONSE: Dear Mr. James, Thanks a lot for your very kind! I am so happy to hear from you and very happy to be the local tour guide for your group in Vietnam (Hochiminh City). Best wishes to you! Tony T.
Excellent guide and transport. Very well informed and articulate guide. Certainly knows his history. TOUR GUIDE RESPONSE: Dear Mr and Mrs David Martin, I am so happy to hear from you and very happy to be the local tour guide for your group in Vietnam (Hochiminh City). Best wishes to you! Tony T.
Tony was able to show my husband parts of Saigon that he remembered from serving there during the Vietnam War. He rearranged the schedule to make sure that this happened and also so we could have a special lunch. My husband had waited 45 years for this experience and Tony made it possible! True meaning of an "individualized" tour. TOUR GUIDE RESPONSE: Dear Mr. and Mrs. Marylou Burngarner, Thanks a lot for your very kind! First, I am so lucky enough to be the local guide of this tour. Second, I feel look like a family's member while travelling with your husband and you. I would like to send "A SPECIAL THANK" to your husband about the real information of Saigon in the past. It would help me a lot for my job in the future. Best Wishes! Tony T.